In Liguria, a main secondi piatti (main course) is fish The olive oil of the region is delicate oil perfect for fish. In fact, the Taggiasche Olive, from this area is my favorite. It’s quite difficult to find in the United States, but some specialty stores sell it. It pairs with fish perfectly and is the best oil for making pesto. This recipe is a traditional fish recipe from Liguria. Typically, the fish is a sea bass, but using a pink fleshed fish like snapper is also delicious. At a restaurant, each person will order a whole fish individually. When making this recipe at home, a larger fish can be shared. 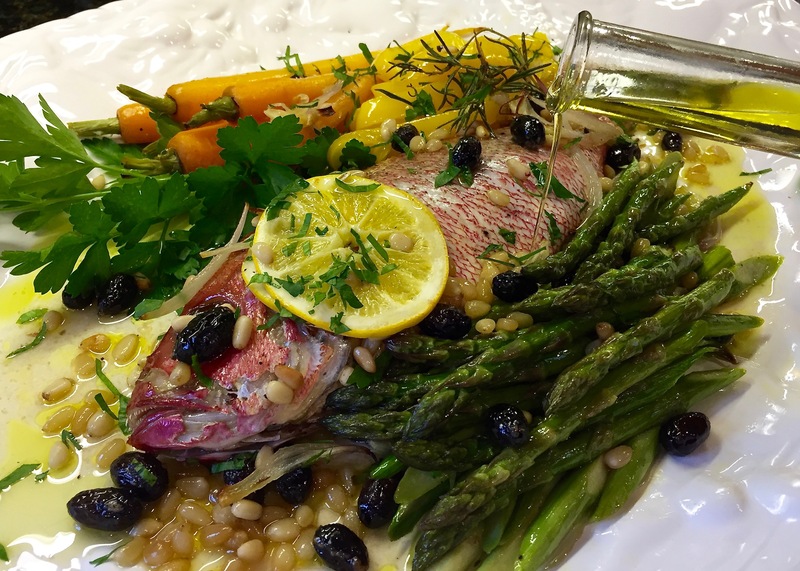 Ligurian fish is an easy healthy dish when served with greens and seasonable vegetables.